BlackBerry is no longer actively working on their classic BBOS platform, with the newest OS 7 now being over two years old. However, the percentage of users on BBOS continues to drift towards the newer versions of the OS. As of October 73.0% of users are on OS 6+ and 45.2% of users are on OS 7+. Both of these rates are up roughly two percentage points from September. This data was collected by BlackBerry World for downloads of the free BlackBerry strategy game Pixelated. 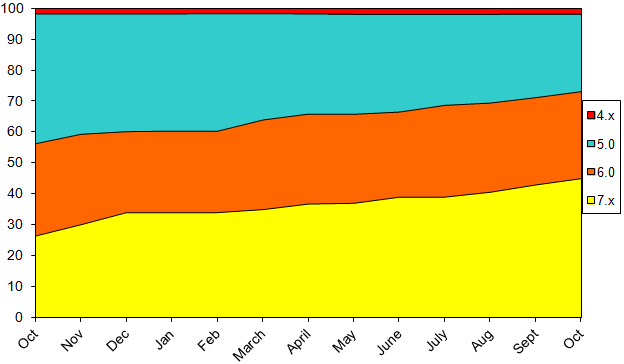 Data shown on the chart is from the beginning of October 2012 through the end of October 2013, and does not include BlackBerry 10 or PlayBook devices.